Energy and the environment are inextricably linked. The need to mitigate climate change, safeguard energy security, and increase the sustainability of human activities is prompting a rapid and global transition from carbon-intensive fossil fuels to renewable energy. For all energy systems, the manner in which an energy system is constructed, operated, and decommissioned can yield both positive and negative impacts on ecological systems beyond those directly related to energy. For example, electricity from dedicated biomass can require over 58,406 hectares (1 hectare [ha] = ~2.3 acres) of land per terawatt-hour per year (ha/TWh/y-1), creating trade-offs for allocation of land for food production and conservation. Nuclear power plant disasters can cause physiological and genetic damage to species—like those observed of the pale grass blue butterfly (Zizeeria maha) in Japan after the Fukushima accident. In western North America, active or pending oil and gas leases exist on approximately 60 million hectares of publically owned land, impacting ecological connectivity and the flow of ecosystem services that humans depend on. The optimization of the energy and Earth system is perhaps the greatest challenge of the 21st century, but one that academia, industry, government, non-governmental organizations, and students like you are poised to address. Apply course learning towards the development of a written mini-review and information graphic on energy interactions with the Earth system to further concretize learning and education of the broader public. 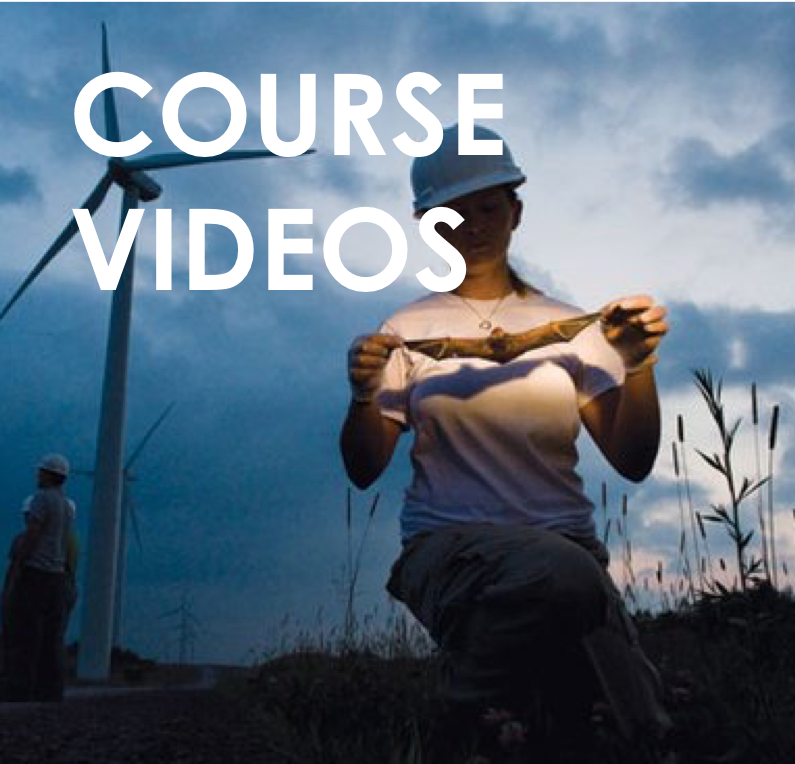 Online lecturers for the course feature some of the world's leading scientists and visionaries working at the interface of energy and the environment. Lecturers (from left to right) include: Ben Elkin (SunPower), Katherine Mach (Stanford University, Carnegie Institution for Science's Department of Global Ecology), Greer Ryan (Center for Biological Diversity), Daniel Sanchez (Net Zero, Carnegie Institution for Science's Department of Global Ecology), Max Wei (Lawrence Berkeley National Lab). Download their full biographies from the bar on the right or here. Ben Elkin is an Associate Product Manager at SunPower Corporation, one of the world’s largest vertically-integrated solar companies. At SunPower, Ben works in the Utility Power Plants team, specifically focusing on software development, land use issues, and solar panel cleaning. Ben holds a B.S. in Chemistry (minor, Electrical Engineering and Computer Sciences) from UC Berkeley and is currently pursuing an MBA from the Haas School of Business’ Evening and Weekend program at UC Berkeley. Dr. Katharine Mach is a Senior Research Scientist at Stanford University and a Visiting Investigator at the Carnegie Institution for Science. She leads the Stanford Environment Assessment Facility (SEAF). Advancing foundations for action, her research is focused on integrative assessment of climate change risks and response options. From 2010 until 2015, Dr. Mach co-directed the scientific activities of Working Group II of the Intergovernmental Panel on Climate Change, which focuses on impacts, adaptation, and vulnerability. Dr. Mach received her PhD from Stanford University and AB from Harvard College. Greer Ryan is the Sustainability Research Associate at the Center for Biological Diversity and provides scientific and policy support to the Center’s Population and Sustainability team. She holds a bachelor’s in molecular environmental biology from the University of California at Berkeley and a master’s in environmental science from the School of Public and Environmental Affairs at Indiana University. In addition to interning with the Center in 2013 before she joined us on staff, she worked as a research assistant in several environmental science labs and as an intern at NRDC. Dr. Daniel Sanchez is an engineer and energy systems analyst studying energy technology, innovation, and climate policy. He is interested in the deployment and commercialization of technologies that significantly reduce energy-related CO2 emissions. Daniel’s academic work focuses on research, development, and deployment needs of these technologies using quantitative methods such as optimization, technology roadmapping, and energy systems modeling. Daniel is currently an AAAS Congressional Science and Engineering Fellow at AAAS. He holds a Ph.D. and M.S. from the Energy and Resources Group at the University of California-Berkeley, and a B.S.E. in Chemical and Biomolecular Engineering from the University of Pennsylvania. Dr. Max Wei is a Program Manager III for the Energy Analysis and Environmental Impacts Division at the Lawrence Berkeley National Laboratory. Max's projects are with the Energy Efficiency Standards Group, as well as with the Sustainable Energy Systems Group. For Energy Efficiency Standards, Max analyzes the geographical dependence of CO2 and health impacts from energy efficiency standards in HVAC. In his current work for Sustainable Energy Systems, Max analyzes total cost of ownership modeling for stationary fuel cell systems, and the learning curve and cost reduction analysis of energy-related technologies. Max has expertise in the areas of techno-economic analysis and life-cycle cost analysis of existing and emerging technology applications; manufacturing cost analysis and total cost of ownership modeling of existing and emerging energy technologies; and modeling future energy systems and scenarios. You will select a topic related to one specific energy-environment interaction to write a mini-review on. This topic will also be the subject for your infographic (see below). You will create an information graphic (“infographic”) related to your written assignment that combines data visualization with design to showcase and disseminate information from the topic you chose and using the articles you selected in a manner that enhances its engagement and memorability to the broader public. The infographic will be shared online and awards for the best infographic, which if you win, can be included on your resume. Awards may include: Student Science Communication Award – Student’s Choice, Expert’s Choice, and Internet’s Choice. Students are assigned videos to watch, which will be posted online. I recommend taking notes while you watch the videos of important take away messages. Students are assigned primary literature, reports, and book chapters to read from the Weekly Agenda and Reading List (download list from the link on the right bar). All resources for assignments are web-based. There are no exams or tests. All reading assignments are posted online. I highly recommend printing out each reading assignment so you can write notes in the margins, write questions/comments (e.g., words/concepts you needed to look up), and highlight important sections, as needed. If you are successful doing this type of in depth and active reading online, then this may be a suitable alternative. Bring in weekly reading materials to each class to reference for discussion. The plurality of points are earned by simply arriving at class on time and being prepared. Being prepared means that you have completed the reading assignments and watched the videos attentively and in full prior to class starting. Students who are late to class lose ½ point. Students will be rewarded for timeliness, attendance, and active participation. For a complete break-down of points per class meeting session, see the Grading Gantt Chart. Late assignments lose 5% each 24 hours late. Grading will follow a standard scale where ≥90-100% = A, ≥80-89.9% = B, ≥70-79.9% = C, ≥60-69.9% = D, and <60% = F. Chromatic variants (+ and –) may or may not be used, but if used, they will be applied to the student’s benefit. Students should not assume that a curve will be applied to the course grading, but if one is applied, it will be a minor adjustment to the student’s benefit. Additional Grading Details | Attendance comprises the bulk of points for this group study course. Missing class follows standard UCD policies including for religious holidays, official extracurricular activities, and medical reasons, and any make-up assignments are subject to the procedures and timing restrictions as outlined in the official UCD policy. If a make-up assignment is administered, it may be in a different format than typical student participation requirements in class. If there are known conflicts with class dates for a university-approved absence or medical release, please see the instructor early in the semester or at least 2 weeks before the expected absence. Provide original, written documentation obtained from proper authorities (e.g., physician). If there is an emergency on the day of an exam (e.g., medical emergency, car accident), notify the instructor as soon as possible and provide original documentation on official letterhead (e.g., signed documentation by a physician or legal authority) justifying an absence. A make-up assignment may then be administered. Falsifying absences and documents will result in a zero for the attendance/assignment/etc and may trigger more severe academic misconduct as determined by the university. Please be on time for all class periods out of respect for our esteemed guest lecturers. Be on time and these potential problems will be avoided. An unexcused absence will result in a loss of four points (4%). All material copyright 2018 by Dr. Rebecca R. Hernandez.